If you discover an injured or sick wild red-tailed hawk, do not attempt to feed it. Instead contact your local animal control. Take care when leaving raw meat out in your garden, as this may encourage other predators to feed. Wash hands and utensils thoroughly after handling raw meat. 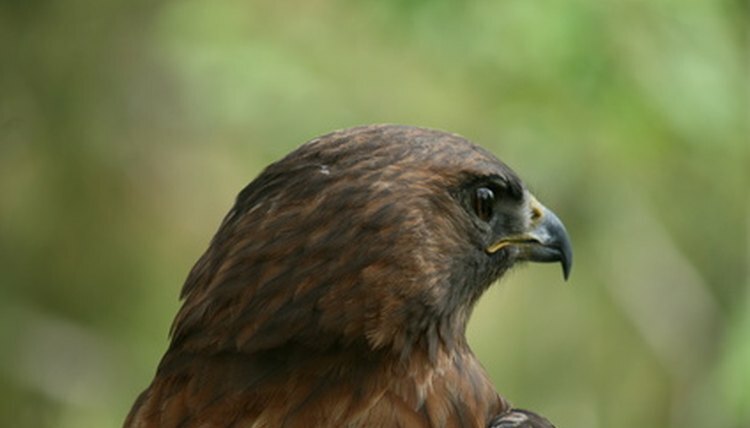 Wild red-tailed hawks are one of the most common birds of prey in America. A type of buzzard, they are carnivorous and in the wild have a varied diet, ranging from snakes and lizards to smaller birds and rodents. Due to their intelligence and appetite, they are commonly used for falconry. When feeding raptors from your garden, care must be taken to avoid injury, both to yourself and to the bird. You will only be able to feed red-tailed hawks if they decide to come to your garden. It is difficult to encourage wild birds to become regular visitors. Cut the meat or fish into bite-sized chunks. Ensure you have trimmed excess fat. Put meat or fish into plastic bowl. Wait until nighttime or until your garden is empty. Put out bowl on a table or similar object, ensuring the food is above ground level.